Search and adopt a Tibetan Terrier near you. The Tibetan Terrier is highly intelligent, loyal, sensitive, affectionate and devoted.The Tibetan Terrier has evolved over many centuries, surviving in Tibet’s extreme climate and difficult terrain. The breed naturally developed a protective double coat, compact size, unique foot construction, and great agility. 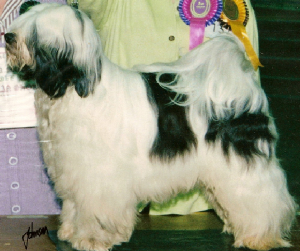 The Tibetan Terrier served as a steadfast, devoted companion. The Tibetan Terrier is of medium size, profusely coated, of powerful build, and square like in proportion. Afall of hair shields the eyes and foreface. The well-feathered tail curls up and falls over the back. The feet are large, flat, and round in shape much like a snowshoe effect that provides traction. The Tibetan Terrier is well balanced and capable of both strong and efficient movements. The Tibetan Terrier is shown as natural as possible. Tibetan Terriers originally came from the land of Tibet. There they were bred and raised in the monasteries by the Lamas almost 2,000 years ago. Originating in the Lost Valley ("lost" when the access road was destroyed in the 14th century by a major earthquake) they were prized as companions, considered to bring good fortune or "Holy Dogs". The breed is called "terrier" because it is of a size widely associated with terriers. The occasional visitor to the Lost Valley was often given a dog to safeguard him on the return trip to the outside world. In the 1920’s a visiting physician was gifted with the Tibetan Terrier who then started a famous kennel upon his return to Europe. The first "official" Tibetan Terrier arrived in the United States in 1956, an import from the above kennel and since then, the breed has attracted fanciers from coast to coast. Tibetan Terriers were valued in Tibet as companions, and were treated like members of the family. In return they eagerly assisted in taking care of the family’s property, their flocks, and their herds, but they were not raised for utilitarian purposes. The breed was kept pure-bred, as any mismating might bring bad luck upon the family and might even be blamed for any future village misfortunes. The Tibetan Terrier was admitted to registration in The American Kennel Club Stud Book on May 1, 1973, and to regular show classification in the Non-Sporting Group at AKC shows October 3, 1973. The Tibetan Terrier is not actually a member of the terrier group. European travelers to Tibet were reminded of terriers from back home when they first encountered the breed. The origins of this breed are origins are uncertain and fanciful, ranging from lucky temple dogs, to working farm dogs. The Tibetan Terrier is a dog with many talents, able to guard, herd, and be quite a suitable companion dog. Their utility in Tibet meant that the first examples of the breed available in the west were given as gifts, as the Tibetan Terrier, along with other Tibetan breeds, were too valuable to the people who owned them to casually sell. As such, the early history of the breed is linked to only a small handful of foundation dogs. The Tibetan name for the breed, Tsang Apso, roughly translates to "shaggy or bearded (apso) dog, from the province of Tsang". Some old travelers' accounts gave the name "Dokhi Apso," or "outdoor" Apso, indicating a working dog which lives outdoors. Other "Apso" dogs from Tibet include the smaller and more familiar Lhasa Apso (called the Lhasa Terrier in the early 1900s) and the very rare Do Khyi Apso (bearded Tibetan Mastiff, ).